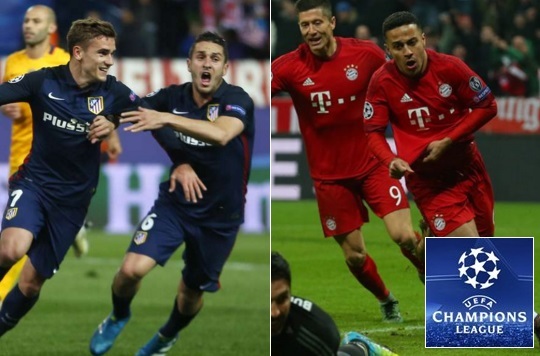 Bayern Leverkusen takes on Atletico on the round of 16 second leg at Vicente Calderon on Wednesday, 15th March 2017. Atletico has won the first leg 4-2 and should have enough quality to see off the challenge from German side on Wednesday and make it through to the quarterfinals. The game kicks off at around 20:45 CET / 19:45 uk time. Atletico Madrid knocked out Bayern Munich last season in the semifinal of champions league in what was a superb performance over two legs. 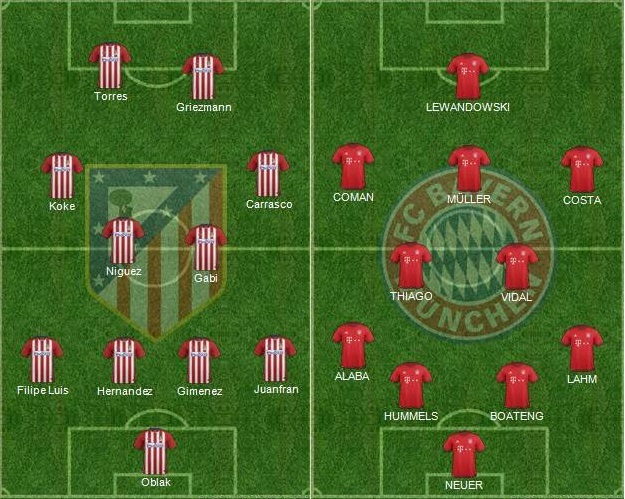 Not much has changed as far as Atletico are concerned, they are still a mean defense with absolute quality players upfront while Bayern Munich has lost Pep Guardiola and one of the most successful champions league managers Carlo Ancelotti has started his reign at Bayern with 100% record so far. These two meet earlier in the year when Atletico Madrid saw off the challenge from bayern in semifinal of Champions League to qualify for their second final in three years. 28′ 1 – 0 Robert Lewandowski scored with superb freekick to finally break the deadlock against Atletico Madrid. Team News & Lineups: As far as the team news is concerned, Atletico Madrid will welcome back Diego Godin in the starting lineup as he recovered in time to train with first team. Rest of the team is likely to remain the same which took the field in first leg. Bayern Munich on the other hand are likely to be without several stars including Arjan Robben and Holger Badstuber ruled out but Carlo Ancelotti is well equipped to put together a strong unit. This is how I expect both teams to lineup on Wednesday night. Match Predictions: Diego Simone and Atletico enjoyed so much success over Carlo Ancelotti and his Real Madrid team back when he was managing in Spain. We can expect another superb night of football where chances will come at a premium. I expect Atletico’s recent good form to continue with them winning with a odd goal. Bayern Munich visited their boggy team Atletico Madrid on Wednesday night for Champions League group stage match and it turned out to be another very closely contested game between the two. Atletico Madrid took the lead through Yannick Ferreira-Carrasco in 35th minute of the game and even though the match was being played at Vicente Caldrone, Atletico decided to sit back and hit Bayern on the counter attacks the move which paid off for most part. 35′ 1 – 0 Yannick Ferreira-Carrasco scored in 35th minute to put Atletico Madrid in lead. Bayern Munich however created several chances but failed to take advantage. Below is the review from the two legged affair in last season’s champions league meeting between the two where Atletico came out winners. Atletico Madrid scored the opening goal in just 11th minute and what a strike it was. 21 year old Saul Niguez recieved the ball at the halfway mark of the pitch and beat 4 Bayern players before produced an absolute class finish to make it 1-0 for Atletico. Once Atletico takes the lead it is so hard to break them down and Bayern Munich found it out as they were hurled of the ball time and again by hard working Atletico players. Bayern had couple of decent chances but the best one fell for Atletico when on a break away move Torres turned Alaba inside out with a nice move before producing a nice flick shot at the far post which struck the woodwork. They got him. Ya baby. I’m a little bitter. Bayern I believe deserved the total aggregate. To bad. I am a very proud German.